I gave away this soup entirely (almost) with the title of this post. It’s so simple, the other ingredients are water, onion, and pumpkin seeds. Butternut squash truly makes one of the creamiest, silkiest pureed soups that one really doesn’t need much else to make it fabulous. I added coconut milk to this soup because I love coconut milk, but you don’t really need to do that. It’s wonderful, though, so I highly recommend it. 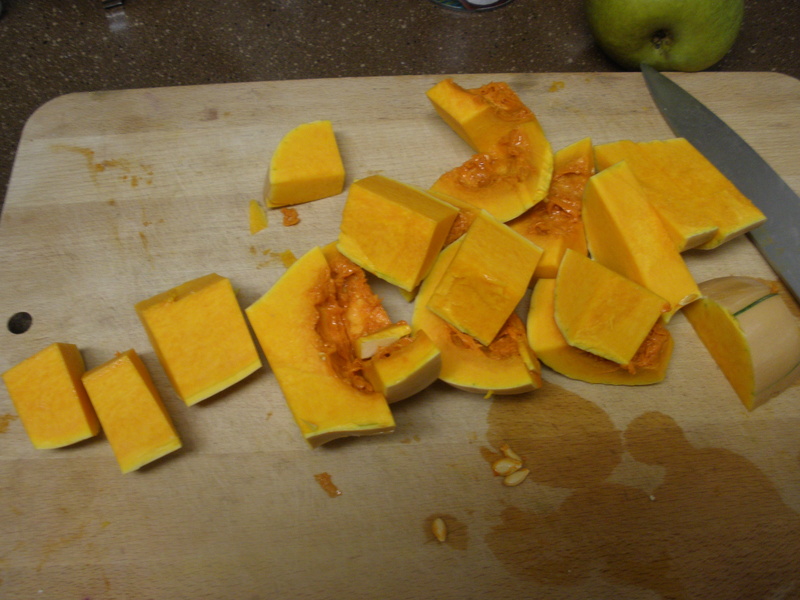 Chop the squash in half, and then small pieces to make peeling easier. Peel the cubes of squash with a knife suitable for peeling. Peel the pears and chop the onion. Heat the olive oil in a soup pot over medium heat. Add the onion once the oil is hot. Stir to coat the onion with the oil, and allow to cook for about 5 minutes. Add the chopped pears and squash, stirring together. Add the water, and turn on high to bring to a boil. Once the mixture boils, turn down to medium low, cover, and cook for about 15-20 minutes, or until the squash is tender (about like a cooked potato). 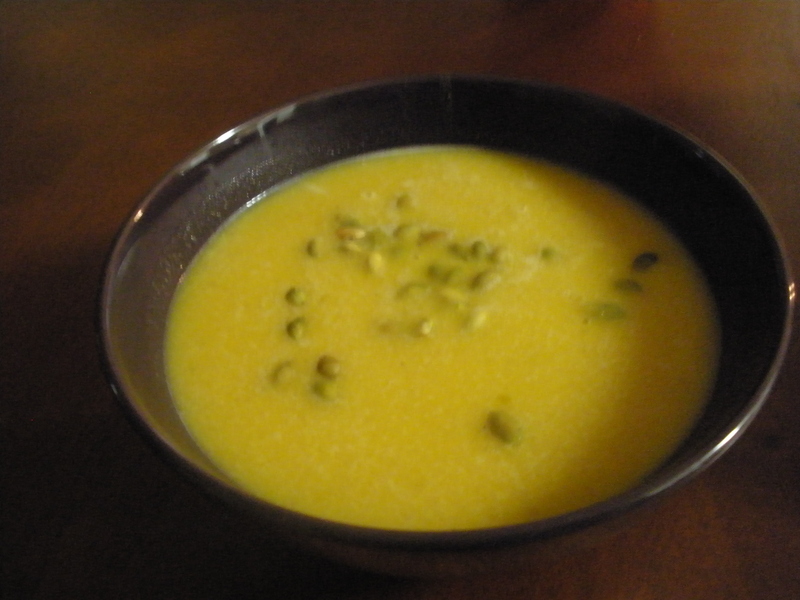 Once the mixture is cooked, use a hand blender or a regular blender to puree the soup, working in batches. Be careful not to overfill the blender so the hot liquid does not pop out and burn you. Transfer each batch to a large bowl or other container. 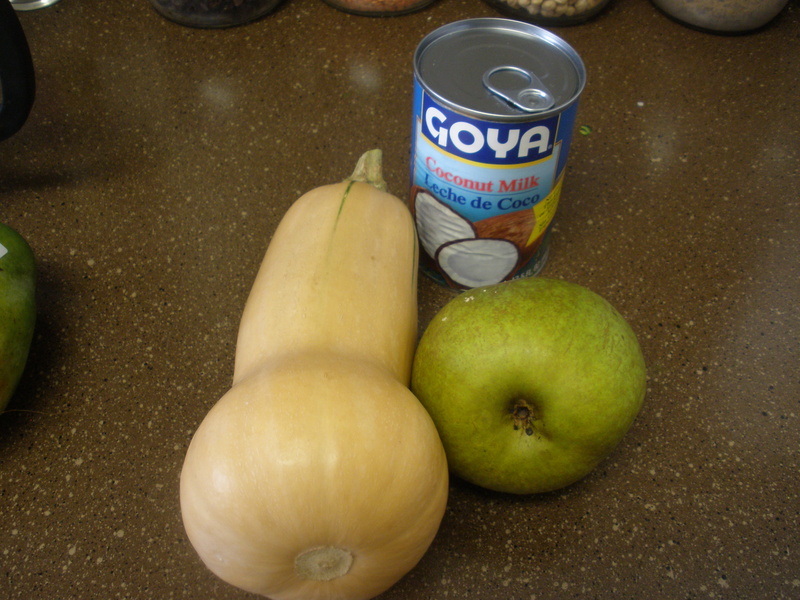 Once it is completely pureed, return to the pot, and add the coconut milk with about 2 tsp of salt. Stir, and taste. Add more salt if needed. Serve the soup topped with pepitas.